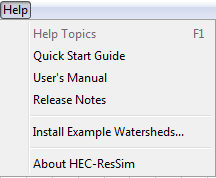 The documentation for HEC-ResSim consists of a User's Manual which describes how to use the interface in detail, and a Quick Start Guide which describes the minimum steps to create a study in HEC-ResSim. Both of these manuals are automatically installed during the setup of the software and can be accessed through the Help menu. To view the documentation without installing the software, you can use the links below.